galvanized gabion net - Anping Tianze Metal Products Co.,Ltd. What are the uses of annealed wire? The galvanized gabion net is an eco-grid structure that is mechanically woven from highly corrosion-resistant, high-strength, ductile low-carbon steel wire. The galvanized gabion cage is filled inside the gabion net, and it is filled with weather-resistant hard stones. It will not be broken quickly due to abrasion in stone boxes or gabions. 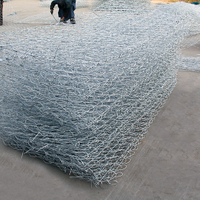 The commonly used specifications for galvanized gabion nets are: 2m x 1m x 1m, 3m x 1m x 1m, 4m x 1m x 1m, 6m x 1m x 1m, 2m x 1m x 0.5m, 4m x 1m x 0.5m, According to customer requirements processing custom. Zinc-plated gabion net can be used as slope protection net, protective gabion net is used for slope support, foundation pit support, slope protection and bank protection project, mountain rock face netting shotcrete, slope planting (greening), gabion net Can also be made of gabion cages, gabion mats for water protection projects, rivers, embankments and seawall erosion protection and reservoirs, river closure.